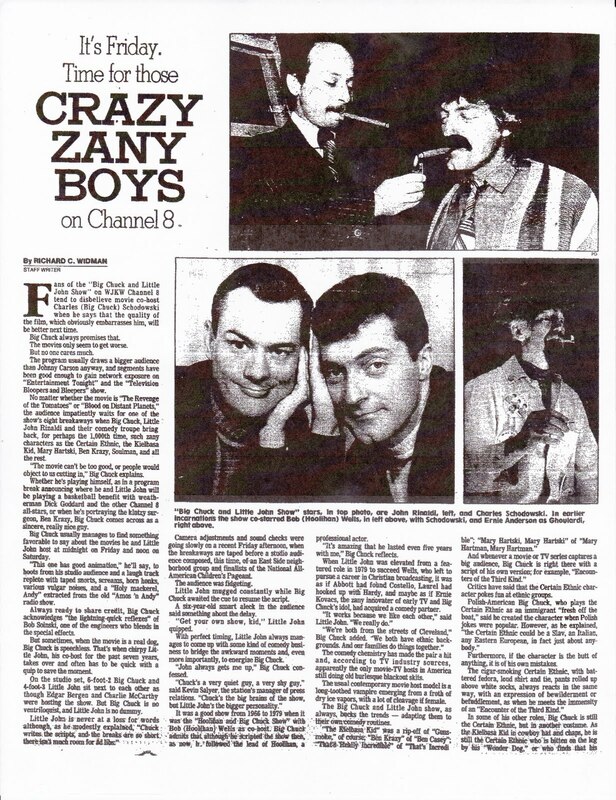 I was looking through the Plain Dealer Archives, as I pretty much do every day trying to find articles, etc. 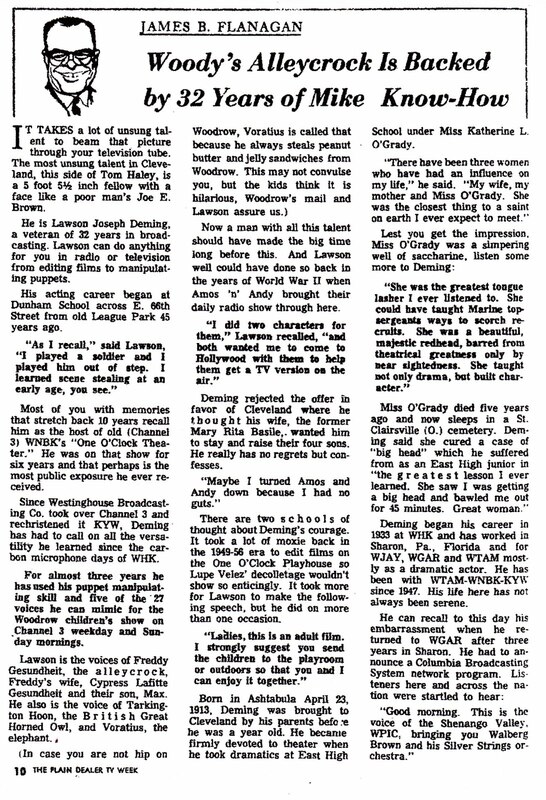 of interest..As I did so today I fould a couple of outstanding articles on the late Lawson Deming, who was famed as Detroit's Sir Graves Ghastly from 1967-Late 1982..Before this, however, he had been at WTAM Radio and WNBK/KYW/WKYC Cleveland from 1947-66..His biggest fame in Cleveland was Woodrow's (Clay Conroy) assistant who provided voices for Woodrow's Puppet friends..Even before WNBK, he had been in radio since 1932..
What follows are two separate profiles in the Cleveland Plain Dealer..The first from January 29, 1965 in TV Week where James Flanagan discusses Deming's career to 1965.. 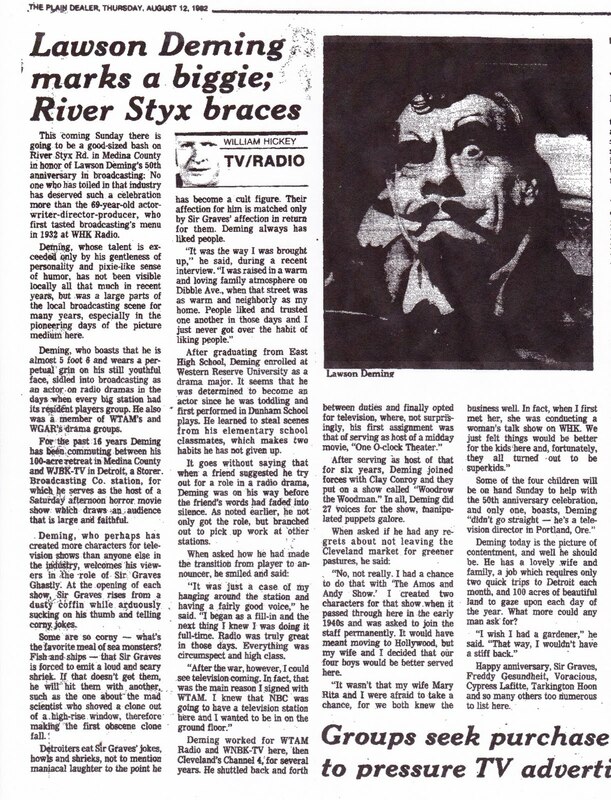 The second article is from August 12, 1982..Columnist William Hickey catches up with Deming on his 50th anniversary in broadcasting..At the end of 1982 Sir Graves has begun to be preempted by Sports on WJBK-2 in Detroit..So the show wasnt officially canceled till 1983..Deming continued to make appearances as Sir Graves into the 1990's before passing away April 24, 2007..
Big Chuck and Lil John-Back Where They Belong..
Part One of a lengthy Plain Dealer article by Richard C. 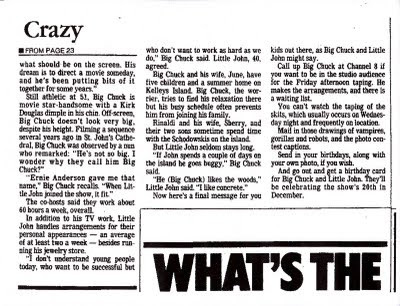 Widman..Attending a taping..Discussing why The Show works..
Part 2:About The Supporting Players in The Skits and The Show's History to 1986..
Part 3:General Thoughts from Chuck and John..Mentioning that the Show's 20th Anniversay is coming up..
Big Chuck and Lil John Hosting a Movie on The Channel 8 set..
With the recent annuncement That Big Chuck and Lil John have returned to WJW-Fox 8 in a new Skit Show Saturday Mornings (11AM) as of September 10, 2011, I thought it would be a good time to give them a plug..The Show has a slightly new opening, with Chuck and John Introducing many of the skits..Some on the first show I hadnt seen before..A lot to look forward to in the coming weeks.. 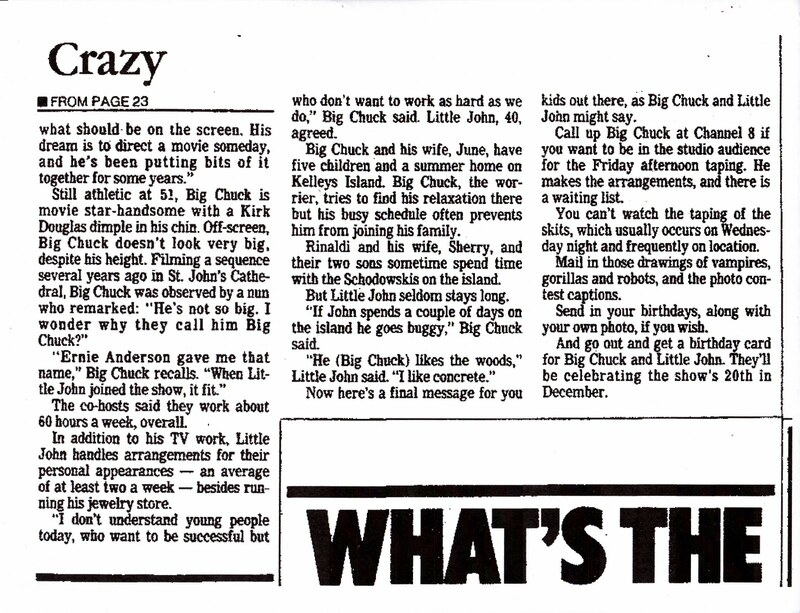 I found this lengthy article on The Big Chuck And Lil John Show during their peak..This was published in the Plain Dealer Friday, August 22, 1986. Written by Richard C. Widman, the article goes to a BC&LJ taping, and talks in depth to the hosts about the history and legacy of the series to that point..And mentions the fact that their show's 20th anniversary is coming up in December 1986. 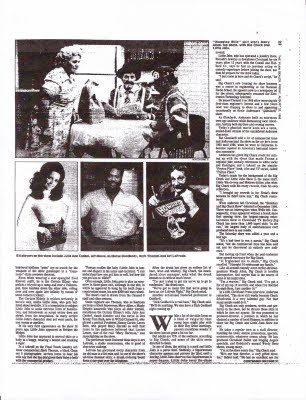 I want to thank the Cleveland Public Library and The Plain Dealer for the opportunity to be able to access the PD archives from home..Has been such a blessing and a help to me with the blog..NOTE:You can click each page to read the print a little better. While The Print came out small, it did come out clear..You might still have to zoom it in a bit.. 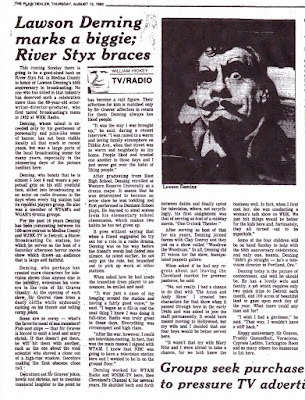 The above advertisement is from the February 11, 1966 Dover (Ohio) Reporter. WHOF Radio 1060 sponsored The Johnny Cash Road Show at Canton Memorial Auditorium..Notice the ticket prices:$3.00 reserved seats and $2.00 General Admission..
Worth noting the Statler Brothers were part of the show by this time..Their first show with Cash was 2 years earlier (March 1964) also at Memorial Auditorium.. 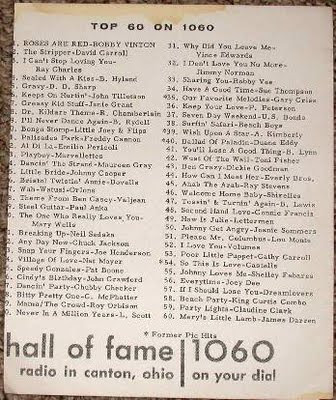 The 1060 frequency has had a long and colorful history in Canton: Begun as WCMW in 1946, the call letters were changed to WHOF in 1961 and aired Top 40 music before changing to country in 1965. 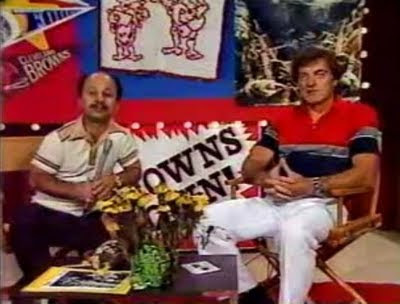 WHOF would become WOIO in early 1967 doing talk as "2-way radio" until the early 1970's..Cleveland Sportstalk Icon Pete Franklin worked at WOIO in 1967 briefly before landing at WERE-1300 Cleveland, then WWWE 1100 by 1973..
WOIO then became "Q10" as WQIO 1060 doing Top 40, then country again through much of the 70's, changing again to WRCW,"Adult Radio". 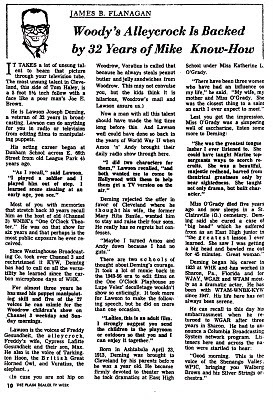 Link to 1962 WHOF survey page..
WOIO Bumper Sticker from the 1970's..
WHOF's call letters are now on 101.7 FM (Formerly WJER-FM Dover and earlier, WFAH-FM Alliance)..1060 is now WILB Catholic Radio..